Yesterday a 92-year-old man, Raymond called me. He was following up after reading a special report on saturated fat and butter in our national newspaper. He was a nice fellow. He apologised for his croaky voice as he currently has pneumonia and hadn’t slept much the night before. He explained he was living in Papakura (South Auckland, New Zealand) with nursing assistance. He reckoned he is getting near the end of his life. I asked how he felt about that. Cool, I think to myself. I hope I’m in this space at that age. He’s been pretty healthy right up until now. Let’s hope the “live long drop dead” mantra plays out for old Raymond. Anyway, he gets right onto his story. “I ended up in England in the 1950s and 60s” he says. “I was like a dog who grows up with pigs, I thought I was one. I thought I was a POM [general slightly derogatory term for Englishman used by Aussies and Kiwis], when in fact I was a New Zealander”. He goes on to tell me he’s seen a lot. At this point I am sort of wondering about the point of the call. He then explains the history of the wartime rationing and the butter rationing in England and with her allies. He explains the bulk butter purchasing agreement between Australia/New Zealand and England which finally finished in 1954. All very interesting but so what? Well it turns out he used to work in marketing, for a big pharmaceutical company. “Oh we used to send these doctors on holidays, ski trips, whatever. Off to Norway no problems. Just as long as they prescribed our drugs. It was and still probably is totally corrupt”. He explains flippantly. Now here’s the bit which he really wanted to tell me. “I just thought you wouldn’t know that, and you should” he explains. That was the conversation. “Keep up the good work, and that’s all sonny” he adds. “I started life on a farm. There were five of us and we had a pound of butter for each of us every week. Five pounds a week. I still eat my pound each week”. I thanked him politely for his call. I know I won’t speak to Raymond again. I guess he just wanted to share his story. There is no way of verifying any of this. It’s an old story, and we can’t change history. Understanding the different versions of it does help us understand where we are now and how to shape our future. And…it’s cool that he called. What is the evidence for condemning butter? There’s the saturated fat thing, but that comes to nothing. Saturated fat is just being condemned – along with carbs and monounsaturated fats – because it isn’t polyunsaturated fats. Sure butter often raises LDL cholesterol, and if you have heart disease and you can’t afford a more up-to-date and reliable test of your lipoprotein particles (size and/or number) this would be something to discuss with your cardiologist. But again, saturated fat raises LDL but there’s no association between saturated fat as an independent factor and heart disease. Polyunsaturated fat is associated with lower rates of heart disease deaths (but not total mortality) but can replace either saturated, monounsaturated fat, or carbs for this effect. Anyone eating a high-fat diet with mixture of fatty whole foods will get ample polyunsaturated fats from nuts and seeds, fish and poultry, meat and leafy green vegetables. Polyunsaturated fat is essential, but cooking fats are probably the worst way to get it in the diet, because the fats can be altered by cooking, less so if it’s cooked in a wholefood matrix (such as meat or fish). The strongest evidence against butter is the historical narrative – New Zealanders, Canadians, Finns, Swedes and Australians once ate lots of butter (and smoked more, and ate fewer vitamins, minerals, polyunsaturated fats and antioxidants, and were exposed to more pollutants, and used different drugs) and had high rates of heart disease. When they ate less butter (and everything else changed as well), heart attack rates went down. Ten or twenty years ago butter consumption in those countries started to climb up again (since 1989 in New Zealand), but heart attack deaths are still going down. The fact is that butter and olive oil are the two cheapest minimally refined fats/oils available in NZ, and butter is always guaranteed to be fresh and unadulterated. But is butter dangerous in the context of a high-refined carbohydrate diet, when saturated fat does rise in the blood, the opposite of what happens on a low carbohydrate diet? In 1967, when NZ butter consumption and heart attack deaths were at their highest, almost all the butter in the NZ diet was consumed in two ways; it was spread on white bread, and it was used in the sweet baking recipes of the Edmonds Cookbook. 4oz butter, 4oz sugar, 4oz flour, and an egg. To be eaten mostly as snacks – empty calories between meals. Meanwhile the French and other European countries also ate lots of butter, but there it was being used to cook fish, meat, omelettes, and vegetables, or make rich sauces, and mostly eaten in meals. With less sugar and snacking and more whole food, and with other fats and oils as well (olive oil, duck fat, lard). I hope no one thinks that there are health benefits from biscuits, cakes and slices made with butter, or pancakes served with butter, or white bread and butter sandwiches! 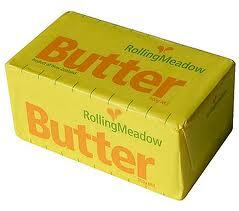 We certainly don’t want anyone taking that message away when they see debates about butter in the media. Enjoy nutritious foods everyday including plenty of fresh vegetables and fruit. Buy and prepare food from whole unprocessed sources of dairy, nuts, seeds, eggs, meat, fish and poultry. Keep sugar, added sugars, and processed foods to a minimum in all foods and drinks. If you drink alcohol, keep your intake low. Don’t drink if you are pregnant or planning to become pregnant. Prepare, cook, and eat minimally processed traditional foods with family, friends, and your community. Actually I would believe his story. Our foods are being manipulated by the manufacturers. The sugar industry rules the American Senate as well as the Heart Foundation. They want to keep the low fat/high sugar theory going for the sake of their shareholders. Never minding the fact that obesity only really took off after they decided that low fat is good for you. Fab story. Reminded me of my dad. He passed at 93. Loved butter, cream, ice cream and ate them often. I love butter and try not to worry about eating too much. It’s good to know someone eats a pound a week and lived into their 90s. It’s interesting to experiment with diet but it is still confusing to figure out what the best balance is for me and it is probably an individual thing. Whole, unprocessed foods, yes, good fats, yes, adequate protein, yes, but carbs, not sure about those. Carbs are unpredictable and powerful in their ability to improve or damage health. That is the part I don’t really understand. Many people achieve good health eating mostly carbs (lowfat), some do well with moderate carbs, and some have to limit carbs. I bounce around with carbs sometimes yes, sometimes no. I’m still experimenting and don’t always have control over my carb intake. How many comfort foods are carb based? a lot! All that to say, finding peace with food and achieving balance is really hard for some of us and I do believe fat and protein (moderate) and lots of vegetables is the way to go, but I still like to have a few carbs just to keep me sane. Otherwise I end up eating pork rinds and I am pretty sure those could not be classified as quality food. it is okay for fats to rise in the blood because the body loves fats for fuel for cellular repair and building and for resistance to microbes. it doesnt stick to anything and doesnt cause oxidation of proteins from oxygen rich blood (sugars do all of this) and requires little insulin to use and store. in fact insulin rises very little with fats including saturated fats like coconut oil and real butter (yummy) sugar on the other hand look out here comes the insulin to reduce gluocse levels to avoid the damage to cells it causes. yikes sugars must be controlled tightly while fats and proteins do little harm in comparison. this is why you can store tons of fat but only a small amount of sugars in the from of glycogen because it takes a lot of water ti dilute it (to keep it from sticking ever get honey on your hands? you need water to get it off)to reduce oxidatio of cells whensugar reacts with oxygen. I do love alot of butter wiht my peanut butter sandwiches, and with my pancakes and my toast. When we talk about saturated fat rising in the blood on high-carbohydate diets, we mean the fat produced by the liver and intestinal cells from the carbohydrate in the diet, along with dietary fats that are there because insulin is keeping them from being used for energy. The blood fats being high in saturated fat, and especially in palmitoleic acid (a monounsaturated fat almost exclusively made from carbohydrate), is a sign that fats aren’t being burnt. I would suggest that if anyone does eat this way, and millions do and stay healthy, that they don’t snack between meals. Whatever type of fat your meals produce, it’s going to be burned when you’re not eating, if you go without carbs for long enough. And the same goes for any excess sugar in the blood. The fats produced from carbohydrates are associated with the types of LDL particles most associated with coronary heart disease, and of course (some) saturated fats increase LDL – so if heart health is important to you, then consuming a high saturated fat plus high (refined) carbohydrate diet isn’t something anyone would recommend. The old, Ancel Keys view, which had its merits, was that the the balance between unsaturated and saturated fat in the diet (the Keys ratio) was an important determinant of heart health. The problem was that changing the ratio didn’t have consistently beneficial effects in experiments. Now we know that low-carb diets tend to improve the Keys ratio (so to speak) inside the body. This is exciting stuff, and what it means is still being explored, but it seems to be related to the reduction in inflammation seen on low-carb diets – the omega-6 polyunsaturated fats increase because they’re not being converted into inflammatory eicosanoids, for example by COX2 (the enzyme you take aspirin to stop. Which might explain why I haven’t needed an aspirin in years). And, of course, the saturated fats decrease on low carb diets because the body easily uses them for all sorts of things, as it’s supposed to. I grew up very poor in Canada during the 60’s and 70’s. I remember meals sometimes were butter on white bread with white sugar, brown sugar if we were lucky. And we were lucky to have food in our stomachs, even if it was white and deadly according to our standards today. Unilever has taken over the traditional British product, Marmite, which I will no longer buy because it has subsequently acquired a bitter medicinal aftertaste. You can test this easily by tasting some and comparing it directly with similar “own brand” products from supermarkets. I am concerned because even cheap fillers do not taste medicinal. I wrote a review to this effect on the consumer review site “Dooyoo” . It was withdrawn from their page within five minutes and I found that I could no longer access my account in order to rewrite it. Upon checking further, I now see that most or all of Unilever’s food products are strongly flavoured, eg “Colman’s” mustard, PG Tips tea. Regretfully I will now stop using these products as well because I suspect that they are being used to disguise something. I don’t eat much fruit. Test blood glucose after eating it.